The last two episodes of Korra have been intense. Which has reflected the way my life has been the past two weeks as well. A year ago, around this time, I lost a close friend of mine: a family member, the godfather to my son, and one of the biggest nerds of color I’ve ever known. The wife and I introduced him to A:TLA, and I know he would geek out over LOK. So forgive me, if this post is a little bit different. As pointed out by fellow LOK Aficionado Julie, Jinora is able to do something that her father cannot do — visit the spirit world. 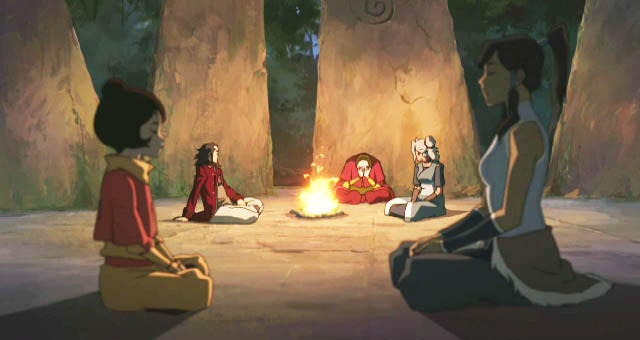 After Jinora and Korra meditate in order to get into the spirit world, Tenzin and crew vow to watch over their bodies. Tenzin also knows that neither Korra nor Jinora will be able to bend in the spirit world, which is something Aang found out in A:TLA. As they transport themselves, they find themselves in a very colorful prairie. Jinora runs off to explore, and as Korra tries to chase after her, she trips on a gopher hole, and let’s say the gopher is not too happy. Korra tries to tell her who she is and well more gophers pop up and start overpowering her. Since Korra cannot bend in the spirit world, she runs away and finds herself sinking in what seems to be some sort of gooey quicksand. She calls for Jinora and both sink together and are transported into an ocean and then boom… a huge crocodile that puts the sharknado to shame swallows them. As a result, the two become separated. Open wide and say AHHHHH! 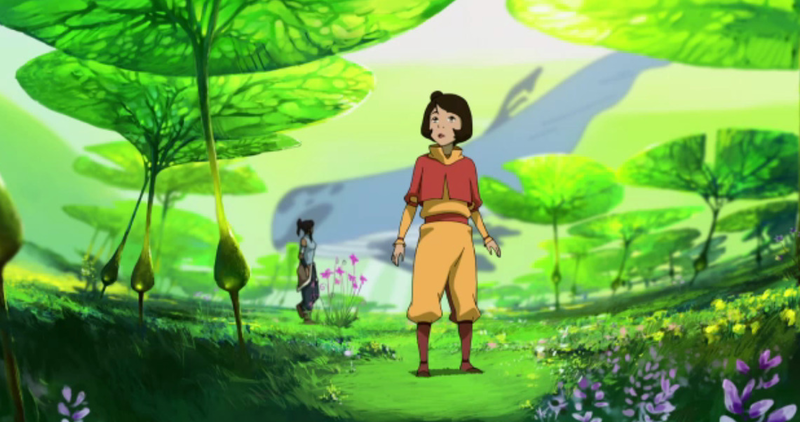 Korra finds herself in a dark forest surrounded by dark spirits. As they try to approach her, she is afraid and starts running away. Then in a pan of the camera, she is transformed into 6 year old Korra. This is where cuteness overload starts happening. A baby red dragon flies towards Korra and because she is scared, she smacks it down. Then we hear a familiar voice that we haven’t heard since A:TLA. Iroh takes Korra to a tea party (because what’s Iroh without tea, right?) for two frog spirits that just got married. He offers Korra some tea and some spirit cake that doesn’t make you gain weight (OK, someone make this a real thing, like now!). Korra notices a teapot, and Iroh lets her know that it’s the teapot that avatar Wan carried Rava in. One of the baddest owls you will ever know. Jinora is aware that the only way she can stay in the library is by providing the owl spirit new knowledge. As she offers to tell Wan Shi Tong about the radio, he interrupts her and says that he knows all about the radio. That it produces sound because there is a little man with instruments inside. Jinora eloquently corrects him and explains the true mechanics of the radio. Wan Shi Tong admits he was not aware of that and was given wrong information from his knowledge seekers (foxes). He still asks her to leave and Jinora explains that she is the granddaughter of avatar Aang and is here with the current avatar looking for information on the spirit portal. The owl spirit allows her to stay but warns her not to break anything. Jinora makes a comment about how she could spend forever in the library, and Wan Shi Tong warns her that the last human to claim that was still there. The camera pans over, and we see the skeleton of professor Zei. As Jinora is assisted by one of the knowledge seekers regarding the Harmonic Convergence, Wan Shi Tong returns with Unalaq. Wan Shi Tong explains that he believes Unalaq is a better friend to spirits then the avatar ever was and as Jinora backs away, Furryfoot turns into a dark spirit. Damn it, FurryFoot. That’s not cool. We are then transported back to the tea party, in which Iroh is explaining the rules of Pai Sho to Korra. She then explains that she has lost Jinora and has a temper tantrum. Spirits turn dark, and the environment totally changes. Iroh explains to Korra that her emotions will change the environment in the spirit world. He tells her that she must always look for peace and light in the spirit world. He then drops knowledge like the Iroh we were used to in A:TLA. No lie. NOC tears were shed. *sniff sniff* Iroh don’t go!! As Korra is leaving to return the red baby dragon, Iroh tells her that he hopes she visits him soon. When Korra embarks on her new task, she is confronted by these scary dog-type spirits. But she applies what Iroh had told her to do: peace and light, and the spirits help Korra climb the mountain. Once the baby dragon is united with its siblings, they combine to create an adult dragonbird. Korra, with a pan of the camera, turns into her true self and climbs on the dragonbird. They take off to search for Jinora. Once they reach the spirit portals, Unalaq forces Korra to open the portal in exchange for the safety of Jinora. She does so, but Unalaq attacks her with water bending. A small battle commences, and FurryFoot escapes with Jinora. As Unalaq starts to spirit bend Korra — and the outcome looks bleak — dragonbird comes to save the day and rescues an unconscious Korra. Korra wakes up back in the physical world and is confronted by Tenzin asking where Jinora is. This episode was intense, and more than likely, they will get more intense as we prepare for the season finale. 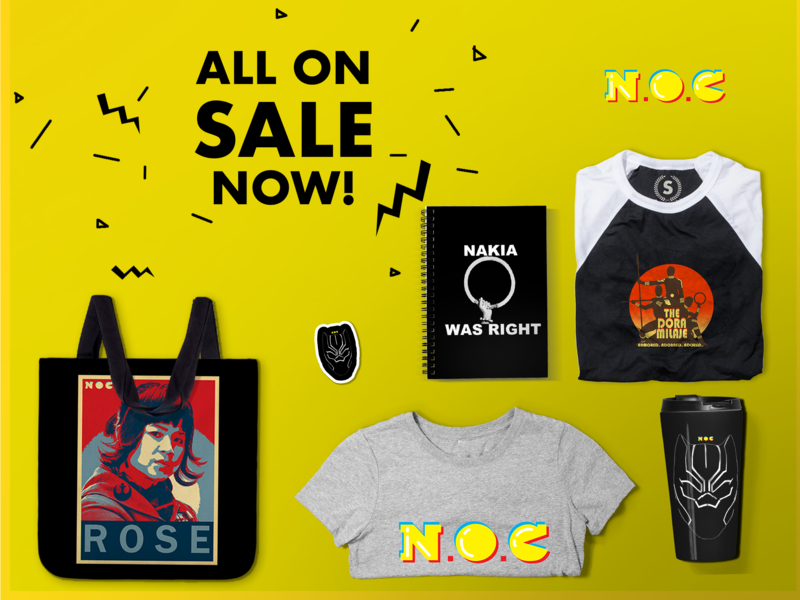 Previous Entry Calling All Whovians! Next Entry Aw Yeah, Tiny Titans!